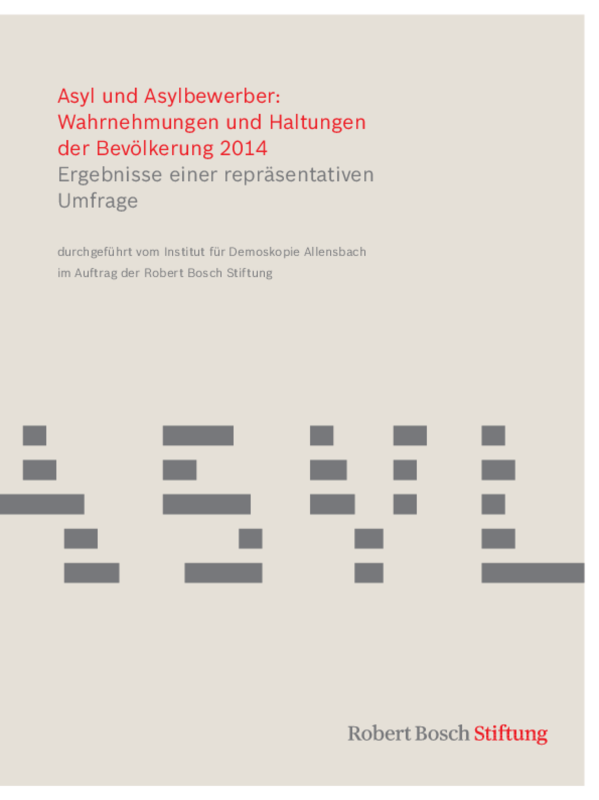 The Allensbach Institute conducted a representative survey on behalf of the Robert Bosch Stiftung on the general public's perceptions, attitudes, and experiences with regard to the asylum seekers and asylum in general. Every day the media reports on humanitarian catastrophes and on the flood of refugees from Syria, Iraq, Afghanistan, and other crisis-stricken areas of the world. Despite the media's current extreme focus on this issue, wide swaths of the population do not pay it any mind. Up until now, the situation and status of those seeking asylum in Germany have rarely been analyzed scientifically, and the information available is incomplete. The Robert Bosch Stiftung would like to help fill in the gaps and, as such, has commissioned additional studies in response to the survey. Comparing this to data from the Allensbach Institute's archives made it possible to illustrate changes over a period of 20 or 30 years when presenting the results. A total of 1,503 people aged 16 years and older were personally questioned between May 28 and June 13, 2014, within the scope of a representative survey. When evaluating the results, one positive finding was that 66 percent of the participants stated that they could see themselves personally supporting asylum seekers, such as through clothing and food donations or volunteer work. A total of 42 percent of the population view closer contact with asylum seekers as interesting. The key findings are summarized in this online publication.